If your smile is crooked or lacklustre, you can smile with confidence with safe, effective and natural-looking veneers. Custom-fitted to enhance the appearance of your “pearly whites” these porcelain coverings are ideal if you have teeth that are damaged, gapped, misshapen, tarnished or uneven. The first step is booking a consultation with one of our dentists to discuss your smile goals. If your dentist determines that veneers are suitable for your teeth, you’ll be informed as to the ideal colour match. Before veneers can be applied, your dentist will lightly minimize the front surface on the teeth. An impression of your teeth is then taken to custom-form the veneers for a perfect fit. The next step is cleaning your teeth with a mild astringent solution. To fasten your veneers in place, we use a tooth-coloured bonding cement. Lastly, we polish the veneers so that they seamlessly blend in with the rest of your natural teeth. Composite veneers, often referred to as “cosmetic bonding” are a less-expensive alternative to porcelain veneers. They are ideal for teeth that are cracked, chipped, stained or gapped. The process involves bonding thin layers of composite resin to the front exteriors of your teeth. We can complete your veneers in one appointment. It typically takes 30-60 minutes per tooth. Composite also can be used to shorten, lengthen or shield a tooth root. 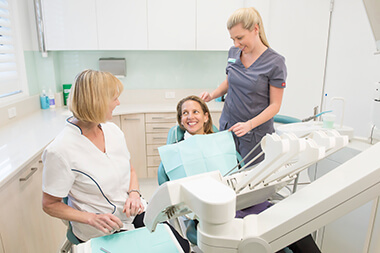 If you’d like to enhance your smile with porcelain or composite veneers, we invite you to contact The Dentistry in Macquarie St today for a consultation! All health funds are accepted.